The letters after Andi’s name stand for Professional Certificate of Coaching, and Certified Professional Facilitator (Pilar met Andi at an International Association of Facilitators meeting – so the networking is great, in these supportive professional communities, but more importantly they benchmark competencies and experience in both cases). He explains that the expertise of the facilitator is to manage the process, of the meeting or project – not to be a subject matter expert, but to really understand and make the most of the human dynamics. His skills in training and coaching are valuable to combine and offer in combination, to ensure a client’s complex needs are comprehensively addressed. Listening, asking powerful questions, and knowing how to give feedback are overlapping skills which can be engaged. Andi has some great reflections about the different attributes of online and face to face facilitation engagements, and how to plan and make the most of hybrid projects – supporting change management over time, and making flexible use of emerging collaboration tools. We also really enjoyed his thoughts about how leaders grow and develop changing skillsets within a team, and how the facilitation and coaching needs evolve with those different levels. Richard recorded this segment for us to introduce the excellent set of resources he has created and shared on his blog, The Field of Facilitation, based on his more than 20 years of experience working with teams. This comprehensive toolset is free to use under creative commons licence, reflecting Richard’s passionate belief in the importance of effective conversation and conversation to drive change, and the vital role of facilitation in enabling this. It is a dynamic resource, and Richard welcomes feedback and suggestions to keep it updated and valuable to the community. 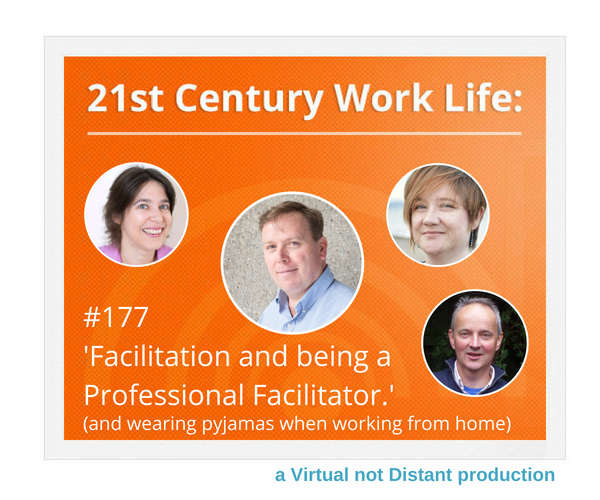 30-32 Article review: The First Rule of Working from Home: Never Wear Pyjamas! Whilst overlooking the mild irritation at the way working from home still has to be singled out as quirky and strange – even requiring its own dress code instructions apparently – we enjoyed chuckling over this article, especially the lady who puts on party dresses to work from home to make herself happy – why not! The reality here at Virtual Not Distant is often more ‘webcam smart’ – as formal as you need to be from middle up! But of all the things to think about when planning an office-optional approach, this is probably not a big deal to get hung up about. We’ll see you again in two weeks, and meanwhile we’d love to hear what you think of our content - please do complete our user survey here!